Dennis Kozlowski grew up in New Jersey and received his Bachelor of Science in Business Administration from Seton Hall University in 1968. Upon graduation Kozlowski held various management positions at SCM Corporation in New York City and Cabot Corporation in Boston, Massachusetts. Kozlowski joined Tyco International in 1975. At that time, Tyco was a small ($20 million revenue) technology driven company. He and his team commercialized the core technologies of Tyco. In 1989, Kozlowski was appointed Chief Operating Officer of Tyco International, in 1990, he was appointed C.E.O, and Chairman of the Board in 1991. Under Kozlowski’s leadership, Tyco grew into a global giant of over $40 billion in revenue and a market capitalization in excess of $120 billion. The company employed 260,000 people in 60 countries. Much of the growth was accomplished by high profile worldwide acquisitions. 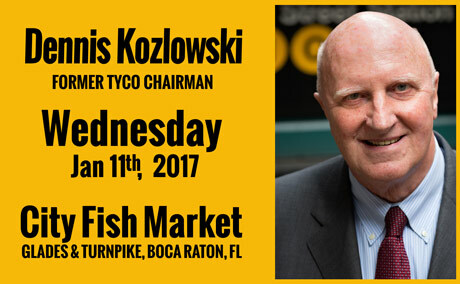 Under Kozlowski’s leadership, Tyco constantly ranked as one of the 50 largest and most profitable companies in the world with its growing medical, security, electronic, flow control, and telecom businesses. Dennis parted ways with Tyco in 2002 in a scandal that is well documented in Professor Catherine Neal’s book “Taking Down the Lion”. Currently, Dennis is co-CEO with Jim Clark (founder of Netscape) of Commandscape, a newly founded technology driven security and building management company. Dennis is also currently associated with Harborside Advisors, a South Florida based merger, acquisition, business consulting and investment company. Dennis currently serves as Chairman of the Fortune Society, a New York based organization that assists thousands of former offenders every year with reentry into society. The Fortune Society assists clients with medical care, housing, training, and employment opportunities. Dennis has received a Doctor of Business Administration from The University of New Hampshire, Honoris Causa, and Roger Williams University. Dennis resides in South Florida with his wife, Kimberly and enjoys time with his two daughters and two grandchildren.